I'm going to keep this post short since I pretty much burned your ears off earlier today. lol I decided to make an altered frame for my desk at work. I really need something bright and cheery and thought this might work. 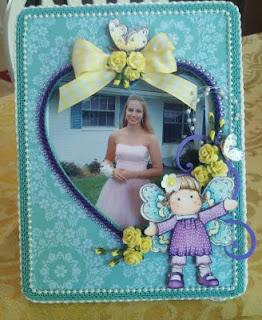 So anyways,today I have a new altered frame that I will be posting for the Magnolia-licious spring contest. This is my first time playing with this particular Tilda and I thought she was quite appropriate for a picture of my daughter since she loved butterflies. Thanks so much for stopping by and taking the time to post on my blog. Hope your having a wonderful weekend. Oh my goodness, Julie! Your frame is so whimsical and fabulous! Absolutely beautiful! Love th pearl trim, the heart shape, and the gorgeous Tilda and flowers! Thanks so much for joining us at Magnolia-licious Hightlites! Your frame is absolutely beautiful!!! What wonderful paper you have used. Butterfly Tilda is perfect since your daughter loved butterflies. You have coloured her beautifully. I love the swirls, flowers, bling, pearls and the added butterfly to the bow at the top!! This will look stunning on your desk at work. What a beautiful tribute to a beautiful daughter. 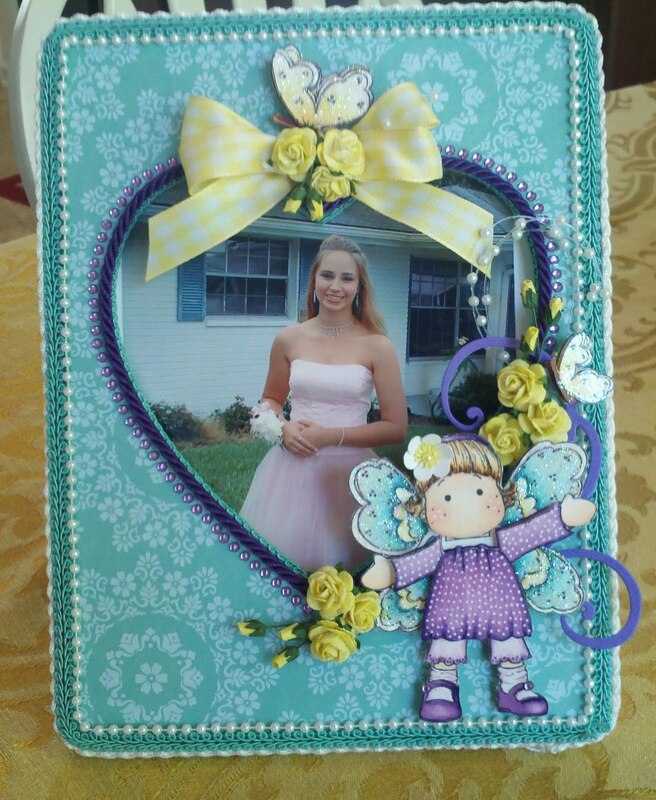 What a fabulous frame and it is perfect for your daughter's picture. This is just adorable! You did such a great job! I love the colors and the pearl border is perfect! Nicely done! That turned out super sweet! Love it, and what a beautiful photo too! What a beautiful tribute to your daughter and way to keep her near you all day. Love your Tilda! How PRETTY! Love how you polka dotted (that's a word, right?) her dress! You made me burst out laughing when you left me a comment today. Thanks for that!! This frame is absolutely gorgeous!! And so is your daughter. I just took a look at your other cards. Wow you are very talented. Luv them all!! Hugs & good luck!! What a fabulous idea! And it came out so very pretty!! Beautiful altered frame and an even more beautiful pic inside! What a lovely frame! Great job! Voi--miten kaunis kortti! aivan ihana idea! Beautiful frame of a beautiful daughter. Thank you for sharing. What a great idea! It's just lovely. MY HEART ALWAYS SKIPS BEATS WHEN I COME OVER. I always leave with so much warmth.I love your creations and your stories hun. What a beautiful frame. Your daughter is also gorgeous! Love what you did to this frame. Beautiful colors and beautiful design. Love it. This frame is so pretty. The colors you used go so beautifully together. Every little detail in the corner is just perfection! 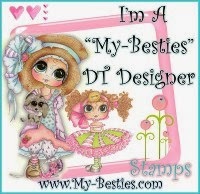 Thanks so much for playing along with us this week at Stamptacular Sunday Challenge. Beautiful frame for your beautiful daughter. Thoughts and prayers are with you! Beautiful Tilda coloring and creating Julie! So glad you linked up to the All That Scraps Magnolia Challenge! Thanks for playing! Beautiful card! The picture is lovely!